Personalised black scarf made from soft fleece and embroidered with a name or initials of your choice. Personalised black scarf made from soft fleece and embroidered with a name or initials of your choice. The black polar fleece scarf is soft and cosy. Cuddley and comfortable fit for men or women. 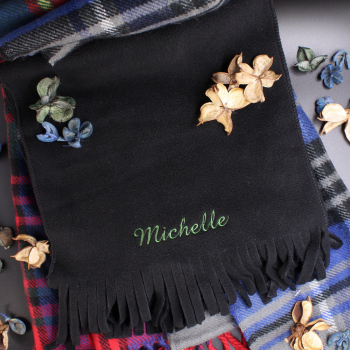 Personalised black scarf made from soft fleece and embroidered with a name or initials of your choice. The black polar fleece scarf is soft and cosy. Cuddley and comfortable fit for men or women. Easy to wash lightweight fleece fabric. Custom embroidered in your choice of font style and thread colour for the embroidered name. A very simple and unique gift idea!